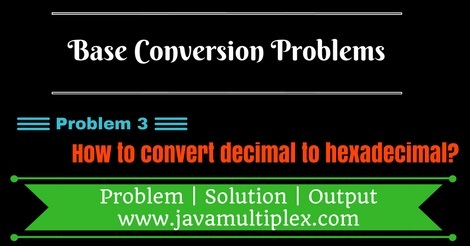 Home Base Conversion Conversion Problems How to convert Decimal number to Hexadecimal number in Java? Write a program in Java that converts Decimal number to Hexadecimal number. Click here to learn how to convert decimal number to hexadecimal number Mathematically. We are using Method 2 : Fast Method (Remainders). // Converting String to Integer. // Convert char to String. // Convert int to String. // Add string to StringBuilder. Output - How to convert Decimal number to Hexadecimal number in Java? Tags : Conversion problems, Decimal to Hexadecimal, Solution in Java, String, StringBuilder, Regular expressions, switch statement, if else statement, while loop.